Move up to the best in loads analysis. From optimizing room and zone loads to detailed HVAC system and equipment sizing, the IESVE software offers the most practical, efficient, and accurate tools available. Efficiently input 3D geometry, envelope, internal gains, and location for accurate loads calculations. Share reports, gain insights from in-depth results analysis, and iterate on building design. Transition seamlessly into detailed HVAC system sizing and modeling. The VE suite of tools supports a complete and fully-integrated workflow, from quick loads analyses to in-depth HVAC system configuration, control, and sizing. Continue seamlessly from there to annual energy simulation. Perform advanced modeling of thermal conditions or integration of HVAC controls with natural ventilation. When using the ASHRAE 90.1 App. G Performance Rating Method, complete the entire workflow from geometry to reports with our workflow 90.1 PRM Navigator. Room and zone loads are calculated with only a few simple inputs: location, 3D geometry, envelope constructions, and internal gains. Powerful results analysis options, including reports, provide more detail. Leverage results to create customizable HVAC systems & generate system reports. 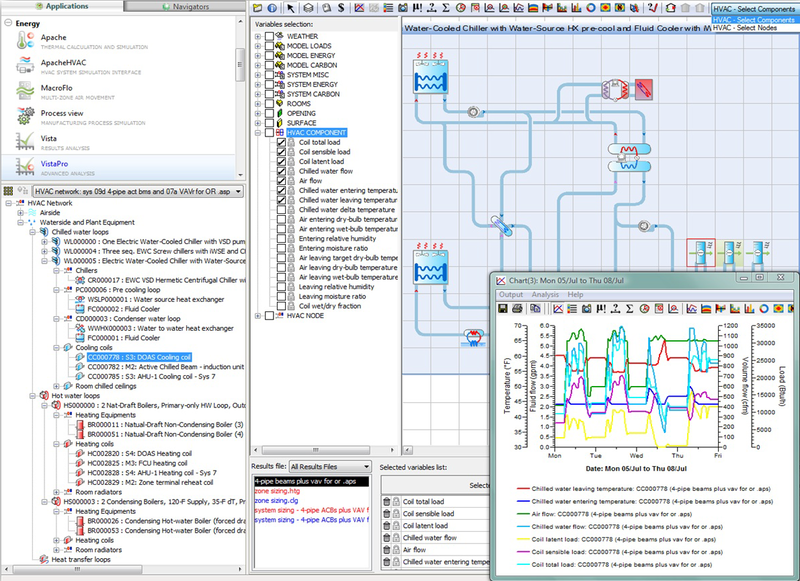 Dynamic energy simulation options integrate natural ventilation, incorporate lighting analysis, and assess compliance. This beginner/intermediate course uses various IESVE tools in the process of HVAC loads sizing using the ASHRAE Heat Balance Method. DESIGN COMMUNITY FEEDBACK: HVAC loads and sizing tools lack visual feedback to enhance design team communication. SOLUTION: IESVE incorporates HVAC zoning with 3D geometry and high-quality visualizations of inputs and outputs to make it easier for all project stakeholders to communicate complex information. DESIGN COMMUNITY FEEDBACK: HVAC loads and sizing is very difficult for high performance systems like DOAS, UFAD, displacement, and Radiant Systems. SOLUTION: Intelligent geometry objects link with HVAC objects to make it faster and easier to create, QA, and calculate loads and energy for all system types – including DOAS, chilled beam, IDDE, WSHP, DX, ASHP, VAV, UFAD, displacement, and radiant heating and cooling. Our detailed HVAC system library is ever-expanding and features these and other system types. DESIGN COMMUNITY FEEDBACK: HVAC loads and sizing reports are essential to high-level checks and QA. SOLUTION: VE 2017 has expanded HVAC sizing and loads reports to make quick checks easier and faster. DESIGN COMMUNITY FEEDBACK: Loads reports can be difficult to interpret beyond high-level checks. SOLUTION: In addition to detailed loads reports, IESVE also supports detailed loads visualization to make it easier and faster to understand the results at a detailed level. DESIGN COMMUNITY FEEDBACK: HVAC loads and sizing is time-consuming for large projects with numerous zones or multiple systems and requires lots of iteration to get it right. SOLUTION: Pre-calculation checks reduce errors on the inputs reducing iterations. And the simulation manager lets loads, energy simulation, and lighting simulations run in the background increasing productivity significantly by letting you continue to work. DESIGN COMMUNITY FEEDBACK: It can be challenging to coordinate appropriate inputs for room/zone versus system sizing. SOLUTION: Providing tools that remember your settings so you can use one model with settings appropriate to each stage of design.
" For us, IESVE is our all in one tool for doing loads, energy, daylighting, etc. Doing loads analysis is simple to run especially with the parametric tool in VE2017. This tool allows us to test ideas and get results quickly efficiently, and the results are accurate. We now use the VE for all of our projects. On a recent office project, using the VE, we were able to improve glazing, reduce mechanical system size, and save the owner money all through the results of our analysis.
" IES actively listens to and responds to the needs of its customers. Our mainstream design teams have given much deeper commitment to the use of the VE – the VE is not just for our one-of-a-kind high performance “jewel box” projects. We are taking advantage of the much more user-friendly load reports on our everyday work. The graphics and visualization tools built into the VE are making it much easier for our teams to understand and optimize system performance and sizing. The ApacheHVAC application uses a flexible component-based approach that allows you to create or customize HVAC systems as you wish. Use either our library of HVAC systems, plant equipment & loops, or create your own systems from scratch. Register your interest for our upcoming free webinar or contact our team to find out more about load calculations and HVAC design sizing tools in the Virtual Environment.